You may think that your hair is straight after using a straightening iron, but you don't know straight until you have had a Japanese straight perm! And gone is the frizz of humid Japanese summer! A Japanese straight perm, or "thermal reconditioning" as it is also known, is a technique developed in Japan in which the internal hair bonds are first broken, and then reconditioned into a straight style; giving glossy, soft and easy to manage hair. Treated hair will stay permanently straight with only the re-growth needing touching up. Generally you will only need a touch-up every six to ten months, depending on how quickly your hair grows and how curly your hair was originally. It works equally well on all hair types. I have had my straight perm for a 3 months now and have absolutely no sign of re-growth and in that time I have not had a single bad hair day! Be prepared, a Japanese straight perm can take from 4 - 6 hours. Make sure you book in advance and take something to read. Your hairdresser should assess your hair. You can choose between 'natural straight' or 'hard straight'. Hard straight is almost inhumanly so, which is why I recommend the natural version. Thorough shampoo and condition of your hair. 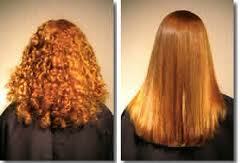 Deep conditioning treatment can be used on your hair should it require it, to prevent breakage during the treatment. Creme based relaxer will be applied to your hair, which will then be wrapped in cling-film. This may be left on for around an hour. A second shampoo and condition. At this point your hair will look terrible. The bonds inside have been broken and it will be a frizzy horrible mess. Don't cry at this point. Hair will be dried and straightened within an inch of its life. I had 2 hairdressers straightening mine for over 30 minutes. At this point the style should be decided. If you want a parting etc now is the time to say so. The hair will be set into this style, and there's no going back. A neutralizer will be put on the hair. Finally setting the hair into position. Be prepared to be wrapped in cling film again. A last shampoo and condition. The hair will be allowed to air dry for a short time (if you are in Japan this is most likely the time you will get your complementary head and shoulder massage). Depending on the salon your hair will be left to dry naturally or blasted with a hairdryer. Well, not quite done. The bonds of the hair are still not set in their final position. You should follow your hair stylists advice on how to care for your hair in the few days after the treatment. Do not wash your hair for 2 days. Do not put clips or hair ties in your hair for 2 days. The hair may set in this strange position, leaving kinks. The first few times you wash your hair after treatment use a hair dryer to dry it completely straight. Use a shampoo and conditioner recommended for use with a straight perm. Price is another thing which can vary salon to salon. I personally paid 12,000 yen, (about 95GBP/160USD). Not cheap, but not unreasonable for something so significant. I hear that it can be even more expensive outside of Japan. If anyone has any experience of this, we'd be glad to hear from you in the comments. Where did you got your treatment ?? ?